Disposable black bristle paint brush 25mm .. Disposable black bristle paint brush 50mm .. Disposable black bristle paint brush 75mm .. 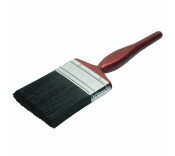 Disposable black bristle paint brush 100mm ..
A quality black bristle maroon handle decorating paint brush. Packed in plastic display. 25mm..
A quality black bristle maroon handle decorating paint brush. Packed in plastic display. 50mm..
A quality black bristle maroon handle decorating paint brush. Packed in plastic display. 75mm..
A quality black bristle maroon handle decorating paint brush. Packed in plastic display. 100m.. Paint Brush Set (3 Piece) Thick pure bristle paint brush with natural wood beavertail handle an.. Paint Brush Set Thick pure bristle paint brush with natural wood beavertail handle and st..